SEPTEMBER 30--Madonna's new "Hollywood" video is a blatant visual rip-off of the work of a late French fashion photographer, according to a federal copyright lawsuit just filed against the pop superstar. The son of photographer Guy Bourdin alleges that Madonna's video is filled almost entirely with reenactments of his father's distinctively racy images (Bourdin died in 1991 at age 62). "It's one thing to draw inspiration; it's quite another to simply plagiarize the heart and soul of my father's work," said Samuel Bourdin in a press release. 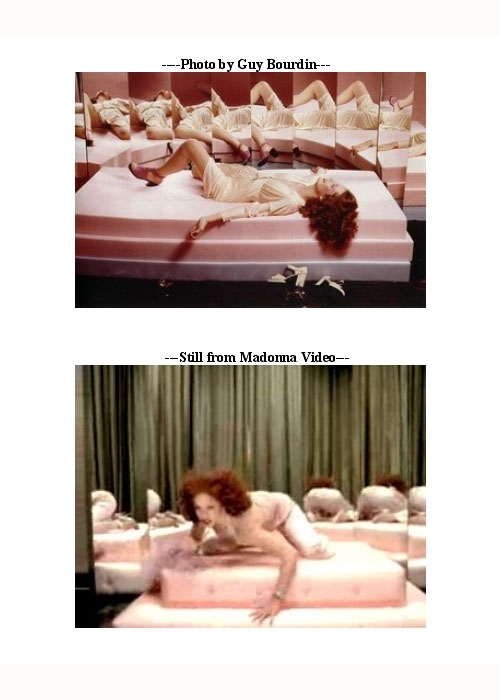 To support his piracy claim, which also names Madonna's record company and MTV as defendants, Bourdin's complaint (click here to read it) includes a variety of comparisons of his father's work and the "Hollywood" video (you'll find six of these side-by-side comparisons here).